The first book I finished reading this year was Agatha Christie’s Murder on the Orient Express. I have seen three adaptations of the film for the screen. In chronological order of their production: (1) Sidney Lumet’s 1974 film, (2) an episode of the television program Agatha Christie’s Poirot, and (3) the recent Kenneth Branagh film. The problem for viewers is that once you’ve read the book or seen a screen adaptation, you know what happens. The problem for the director, then, is to make the retelling worthwhile. —The doctor instead of being a bumbling Greek (Dr. Constantine) is actually part of the conspiracy. —The opening offers a jolting juxtaposition—a public stoning in the streets of Stamboul which precedes the crime on the Orient Express and offers much to think about on the subject of justice and mob rule. —The depiction of the actual murder on the train was the most graphic. The Sydney Lumet film is star-studded, although for that matter, so is Kenneth Branagh’s. What is a little jarring about Lumet’s adaptation is the music. There are moments when it’s over the top, especially the opening titles and when the train pulls out of the station. It’s music as overture and interlude rather than underscore. What this production gives us is a sense of what Poirot is up against. As Mrs. Hubbard (Lauren Bacall) arrives at the train, she hears Poirot’s name mentioned. We see some recognition on her face, which adds some mystery: Who is this woman? Why does the name Poirot cause her to stop? Is there a certain wariness there? Why does she move on rather than introduce herself? Film is a collaborative enterprise. It’s fun to see how Branagh continues to work with Patrick Doyle for the soundtrack to his films. As the train begins its journey, I thought I heard an allusion to “I Get A Kick Out of You,” which was one of the songs that is part of Branagh’s production of Love’s Labour’s Lost. You wonder if this is a favorite of Branagh, Doyle, or both (or just coincidence). Of the three Poirot’s, Branagh’s (he directed and stars in the film) is the most dynamic in personality (warm and charismatic on the one hand and aloof and judgmental on the other) and displays the most inner turmoil in both life in general and in the solving of this crime. A backstory invented for this film has Poirot carrying around a picture of and talking to a lost (we don’t know how) love named Katherine. The three productions are an interesting counterpoint. In the Lumet version, the conspirators come across with more of an affect of premeditation. When Poirot decides to let them go, they break out the champagne and raise their glasses—mission accomplished, justice has been served. They are judge and jury, imposing justice. Does it feel like Poirot has lost rather than chosen? In the television production, the stakes are high on a personal, legal, and international level. Since each individual conspirator has deceived Poirot, things get pretty heated between he and each individual as well as between he and the group. The train feels awfully crowded at the end. In the Branagh film, everyone is broken, including Poirot. The climax of this production has Poirot handing Mrs. Hubbard a gun—what will she do with it? Her decision is heart-breaking which leaves Branagh’s Poirot also heart-broken. The moment is deeply affecting. (The dramatic action, in general, is greatly heightened in this version.) We see Poirot’s anxiety in having to explain a lie as the truth rather than judging the actions of the conspirators. He is both Inspector Javert and Jean Valjean. I had been thinking about point of view in writing. It occurs to me that a similar thing is in effect with the making of television and film. I used to think of the camera (and by “camera” I mean what we eventually see on screen, often an incredibly complicated synergistic process) as the benign but necessary part of our understanding a story told in a visual medium. The only way we experience a television program or a film is through a camera lens. But it’s not as simple as that. The camera is the authorial voice of whatever we’re watching. In other words, the camera is the storyteller. The storytelling may be expert or novice, the story may or may not engage us, and the subject matter may or may not be worth our time, but it’s through the camera lens that we experience the story. The camera has a point of view and we don’t want to be distracted by it. We don’t normally want to be thinking about the fact that we are watching a screen. With the visual medium of television and film, it seems like most stories are “told” in the third person. A first-person story, where we never see who is behind the camera, would be a little odd, even though it works in the written world. In film we may jump to that point-of-view for a moment, say, for example, when a character picks up a camera and now we get a glimpse of what that person is looking at through the camera, but we don’t stay there for long. Note: It seems a second person point of view is a common part of film-making. Advertisements, especially, are attempting to make us the protagonist of the story. But most visual storytelling is in the third person: this is what happened. I had a long drive last week and finished listening to Highest Duty: My Search for What Really Matters by Chesley “Sully” Sullenberger (New York: HarperCollins Publishers, 2009). This story is told, naturally, in the first person. That night, on a whim, we watched Clint Eastwood’s film, Sully. In general, this film has that necessary shift to third person, but I noticed that Eastwood plays with the first person quite a bit in a creative way. You can see it even in the trailer where Captain Sullenberger is on the screen but then we begin to experience what he is thinking and feeling. The shift is done so smoothly that you hardly notice it. If it is confusing, it’s all straightened out rather quickly. (“Oh, he was dreaming.” “Oh, he was staring out the window and imagining what could have happened.”) Often, what happens is that what we’re seeing makes no sense because we already know how it ended, so our minds are trying to make sense of what we’re seeing. And then there is a trigger, like another pilot calling at Sully or Sully waking up in bed. It helps make the story feel like it’s in the first person, otherwise the only way we would know what is going on inside the character of Sully is what Tom Hanks says or does to convey it. But in no way do you feel like the camera is trying to manipulate you. The camera then jumps from Diana in present times to a slow zoom on this old picture which is followed by a cross fade to a young girl that we presume (correctly as we find out soon enough) is Wonder Woman when she was a child. Sometimes, though, we are fooled (Tricked?) by the camera. While Steven Spielberg’s Saving Private Ryan is remarkable, the film opens with some visual sleight-of-hand. The film begins with music only. No image on the screen. A lonely french horn call is answered by snare drums, in a kind of military cadence. French horns and trumpets take turns responding to a drum beat. On the screen a large American flag appears, waving in the breeze. It’s an overcast day but you can see the sun is shining behind and through the flag, which is nearly washed out in the brightness. We cut to a shot of an elderly man as he walks, sometimes shuffles, along a path. He doesn’t move quickly, but he moves with purpose. He’s going somewhere. Next we see a group of three distinct generations who appear to be walking behind the man and we make some assumptions about them. It appears to be his family: A woman, who we guess might be the elderly man’s wife, walks in front of a man and wife and their three daughters and son. 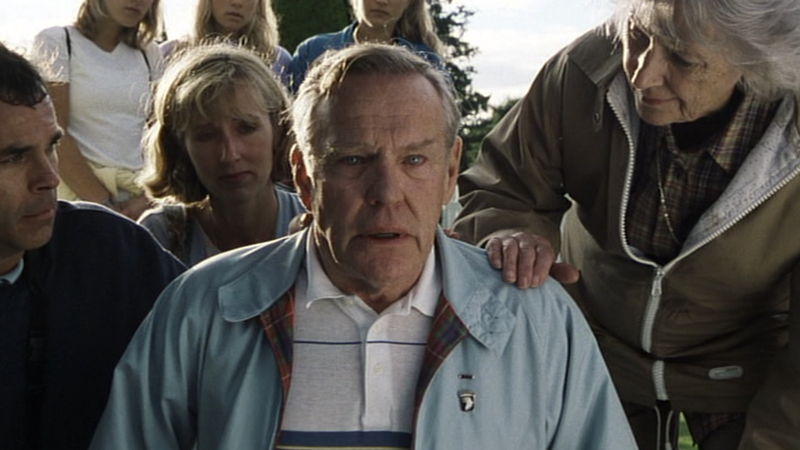 When the film cuts to a wide shot, we see that the elderly man is leading this group and they are giving him plenty of distance and moving at his pace. It’s his agenda, his journey. They walk along a path that overlooks the ocean. The man walks up near the camera and as he steadies himself on a tree he looks past the camera. You can see some distress in the man’s face, although we won’t know why until the very end of the film. We cut to another large U.S. flag rippling in the breeze. Then we see a French flag. And though you might not know where we are, yet, you know it has something to do with the United States and France. Orchestral instruments continue in the background: horn and trumpet calls, drum cadence. The tone is solemn. Grave. All of this is serious and we take it seriously. We cut back to the man as he walks onto on a large grassy space and as the man walks past row upon row of crosses and the occasional Star of David, now we understand where we are—it’s the U.S. cemetery at Normandy. The man stops. He is overcome with emotion and falls to his knees sobbing. His son cries out, “Dad!” as his family runs to him and reaches out to comfort him. As the camera zooms into the man’s eyes, we are suddenly transported back in time to the beaches of Normandy—June 6, 1944. D-Day. Without giving too much away, if this was like Wonder Woman, we would be zooming in to see what this as yet unidentified person saw back in time. But we’re not. We are not zooming in not to tell this person’s story, but another story. (That’s the sleight-of-hand.) Alternatively, we are zooming in to tell a first person story, just not the one we are led to believe. Ultimately, we don’t seem to care about the trickery because it’s, as I say, a remarkable film. All is explained and understood at the end of the film. We can handle the trick (if it is a trick—it occurs to me that another way to understand this moment is that we are zooming in not to see what this person saw, but to reflect on what he is seeing in present day, which is revealed at the end) because we trust the voice. As viewers we want to trust that voice. We need to know that what we are seeing is true, even if it is a made-up story. In a way, it may be easier to trust what we are seeing is true when it is a made-up story. But somehow it’s okay to put Tom Hanks in the captain’s chair and have him “fly the plane.” I offer my willing “suspension of disbelief” and in return I am told a story that is “true” even though what we are seeing is make-believe. One of the quirks of film, as opposed to the stage, is that filmmakers do their very best to make us exercise our suspension of disbelief as little as possible. They want it to seem real. One of the dangers of CGI is that as good as it is, we can feel like we are watching a video game rather than human drama. At one point Pierce complains to his assistant that he had given him the wrong Mahler tape. Pierce had asked for the Solti, not the Karajan version. I laughed because I understand those kind of preferences when it comes to Mahler. (I’d be asking for the Bernstein/Concertgebouw or Kubelik/Bavarian Radio Symphony Orchestra version myself.) When the show was over, it occurred to my inner snob that I had never heard of a Herbert von Karajan version of Mahler 1. I didn’t see one on Vincent Mouret’s discography and got confirmation that he hadn’t recorded one by someone on the Mahler ListServ. Was it possible that one of the most highbrow characters ever created for television didn’t actually know his Mahler? Why couldn’t they get the details right? The main problem, though, as I recall, was that Dr. Pierce was not just a brilliant neuroscientist who taught college and helped the FBI solve crimes, he had schizophrenia, which meant that we never knew when what we were watching “actually happened” in the universe of the program or was simply going on in his head. It was confusing and troubling. A bit like hiking on shale, where you can’t easily place your weight. I don’t think I watched another episode though I think the show made it through three seasons. As viewers, we need to trust what we are seeing. We don’t like tricks. Years ago, there was an entire season of Dallas that turned out to be a dream. Fans were furious. If there are some visual tricks, there need to be good reasons. Two M. Night Shyamalan films play with you a bit as a viewer (maybe they all do, these are two that I remember)—The Sixth Sense and The Village—but somehow you don’t resent it. The Sixth Sense is great fun to go back and watch a second time if you didn’t “get it” the first time. Then you can say to yourself, “How could I have missed it?” The Village is also good fun. “What’s going on?” . . . “Ohhhhhhhhhhhhhh.” But in neither case do you feel manipulated excessively. We are fooled but not made fun of. Then there’s Memento. It’s been years since I’ve seen it. I remember the whole thing being really disturbing because you didn’t know what you could trust. Still, I don’t think I felt tricked, though (just wigged out). I think the authorial voice of the film tried to be as honest as it could, given that it was telling the story of a guy who had problems with memory. Maybe I’ll revisit that film sometime, though I’m not as comfortable with the disturbing as I may have been in the past. We don’t seem to mind being tricked if we’re in on the gag (at least eventually). The television show Leverage featured a little sleight-of-hand in each show. A convenient detail was left out so that at a key moment in the story it appeared that everything had gone wrong. But in that moment the camera didn’t show everything. Later we learn that what looked bad for the protagonists was actually what the protagonists had planned to have happen. What looked bad was actually good. Eventually we are shown what we missed and in the end justice is served and the good guys live to fight and prevail again another day (or in the next episode). Leverage had a charm to it. It was obviously campy and had at one point the task of making Boston look like Portland and the following season of making Portland not look like itself (rainy and dreary), but that was no matter. The producers made a deal with the audience: “We’re going to mess with you at least once an episode. But we promise to fill you in by the end. But we’re all in this together. We’re here to entertain you.” So the camera was both loyal to us as an audience and was winking to us as an audience. It was a conceit that we embraced. No problem. The camera was on our side. It’s a risk to play a trick on an audience, even though The Sting managed to do it and earn seven Academy Awards from the ten categories for which the film was nominated. The issue is that the camera, like the author, has omniscience. It knows everything but is selective in its telling. The mystery novelist knows why the murder was committed and who committed it. But they don’t tell us. What do they do? They portray the action from the perspective of one or more of the lead characters—or from the point of view of “Here’s how this gets handled.” Somehow in the telling of the story we are not given all the information and we don’t seem to mind. We look past the fact that the camera is not giving us key information right from the top (for example, Who did it?) because it will be more interesting to focus on the process of figuring out Whodunit? We are guided along and watch how the mystery is solved. I’m thinking of Erle Stanley Gardner’s Perry Mason (both the books and the television programs). I struggle to keep up with who’s who in these stories. But an essential part of the narration is that the narrator is withholding key information from us. It’s information that would answer everything. And the interest becomes how does Perry, with the assistance of Della and Paul, makes sense of it all. How will Perry get out of the jam he is in and how will he save the person who is in the jam? I think the same thing may be true with Murder on the Orient Express. This is a film about Hercule Poirot. The camera shows us very little beyond what he could know by observing from his point-of-view, even though the story is shown in the third person. Most of the time we are following him around—experiencing what he experiences. A variation on this is the old Columbo series, which I used to watch faithfully. The way this series worked was that at the beginning of every show we saw a murder committed and we saw who did it. The murderer thought they were pretty clever. But then Detective Columbo enters the scene. Initially, we knew more than he did, but eventually he catches up. And the whole point of the show was for us to watch him figure it all out. It wasn’t always clear to me when he knew for sure who the murderer was, but you got the idea he figured it out early on. So then it was all about how he would trap the person into giving themselves away. The show was a counterpoint between this too-clever murderer and this more clever, though rumpled, police detective. For me, an enjoyable film or television show means that the camera pays careful attention to allegiances. The primary allegiance is to the audience. It is mostly a commercial enterprise, dependent on viewers. Do the producers respect us? The other allegiance is to the story and the characters. Since, we can’t see everything and there isn’t time either to film or to watch “everything,” in the telling of the story, the camera needs to be selective in what it pays attention to, which means it needs to be loyal to one or more characters in the film. And those characters in some way need to justify that loyalty. I was a fan of the television show, Castle, for most of its run. This was a show about a writer and a police detective who solve crimes together. I think it took some inspiration for its dialogue from the Thin Man tradition. The show Castle was interesting for the way it played with the authorial voice and its allegiances. The first season had a fairly defined look and formula as a police procedural. Routinely, a song served to open and close each episode, to be ironical or add some poignancy. The show seemed to take itself, especially its independence as a contained universe—its own world within the world—fairly seriously. In the second season, things loosened up quite a bit. Emotionally, the show played more with the idea of “Dramedy” (drama + comedy), so that the tonal range widened. You never knew if an episode would be normal, fun, bantery Castle or dig into the deep and disturbing and decidely unfunny back story of Detective Beckett Castle. And then in the second season the show began playing with the fourth wall. In the Halloween episode (“Vampire Weekend,” Season Two, Episode Six), the character of Richard Castle (Nathan Fillion) opens the show by suiting up in a Halloween costume, the outfit worn by the character Fillion played on a previous show (Firefley) and movie (Serenity). It’s a pretty funny moment. Alexis asks, “What exactly are you supposed to be?” which is followed by a musical allusion to the theme song of the series, introducing music from one show into another show. When Alexis wonders, “So, don’t you think you should move on?” this has a meaning both within the show for the character and outside the show for the actor. The double-meaning is great, but it changes the nature of the show. This is no longer a romantic comedy/police procedural. It’s a show about people who are on television reminding us they are on television. There’s a moment at the beginning of another episode where Fillion all but breaks the fourth wall. There were a number of Firefly/Serenity references on the show. One thing you can say, Castle had a unique relationship with its audience so that the 100th episode (“The Lives of Others” | Season 5, Episode 19) could break the rules about playing tricks. While I have my favorite Murder on the Orient Express, I like all of them because they play it straight. They offer integrity of the author’s voice. The camera takes me and the story seriously. Each adaptation presents actors portraying people pretending to be other people and one man whose search for truth is compromised.